Friday afternoons are never great. I don’t think I’m the only parent in the world who thinks that either?! By Friday afternoon every week, Mini is tired, ratty, hungry, and not very pleasant to be around. We manage this by having film afternoon some Fridays after school. Instead of reading like we should, we watch a film – usually something animated, or very often Nanny McPhee! This is a nice, gentle activity, gives me and Mini a chance to cuddle up, and Dollop dips in and out whilst playing uninterrupted! Mini had a special class assembly on Friday when parents are invited in to see what the children have learnt. Mini was anxious for mummy and daddy to come this time (mummy and nanna went last term), so the NC took the day off work, and happened to arrange an interview for 8.30am that morning too…good planning. The minute Mini found out about the interview, he went into panic mode. ‘Daddy won’t be able to come to assembly’ ‘Daddy’s going to his interview instead of coming to see me’. No matter how much we reassured him that Daddy’s interview would be finished a long time before lunch, and assembly wasn’t until a while after lunch, he could not be calmed. Cuddles led to Mini kicking, Soothing words led to Mini shouting. Daddy had to leave, and shortly thereafter Mini calmed himself down, but remained in a hyper state. Little things set him off (the sound of the hairdryer, Dollop dropping a ball, him not being able to put his sock on first time), and he’d have a panicked few minutes before being talked down again. The assembly was lovely. Mini smiled. Mini was eloquent when he needed to be. The whole class received praise from their head teacher. Mini walked home with the NC and Dollop, while I stayed and had a quick chat with his teacher. It all went quite well. I gave her some information specially written for teachers about attachment issues. 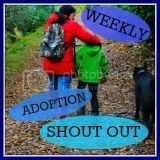 She offered support if it was needed, but didn’t have much of an understanding – he’s perfect at school so I’m describing a very different child to the one she sees! Mini did well on arriving home, he changed without being asked, had a snack, was polite, well behaved and thoughtful…for about 30 minutes. Then the tiredness kicked in, and it was magnified this week from all the excitement around assembly and the novelty of having the NC there after school, and of course it was the first week back after a half term of resting. Tiredness does not equal lifeless sofa sprawling in our house. Tiredness equals tantrums, winding up of little sisters, screaming, refusing to move, get up, leave Dollop alone, stop pulling mummy’s hair, eat, talk or stop talking, cuddle, brush teeth, bath, go to bed, or anything asked of him. I can’t remember specifics, already I’ve blocked them out, and Mini will have too. I can remember ‘no’, ‘go away’, ‘NOOOOOOOOOOOOO’, ‘I said no!’, ‘I WILL NOT!’ from Mini. And ‘I love you’ from me. ‘I love you’ from the NC, and ‘wuv oo too’ from Dollop. Then after a while ‘I love you all too’ from Mini.We get there in the end!